It’s time to get wild! 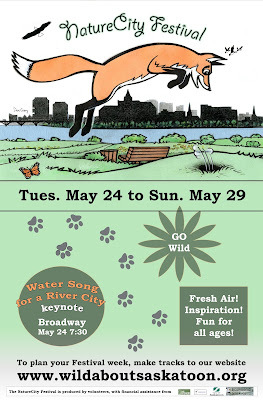 Saskatoon’s fourth annual NatureCity Festival runs from May 24 to 29 and there are over 50 activities to choose from. Here’s just a sampling of the fun to be had. May 25 & 27 @ 7 pm, May 28 @ 10 am – Discover Montgomery Place’s forest, the Richard St. Barbe Baker Afforestation Area. May 29 @ 9:30-11:30 am – Off limits! But not today. Take a walk among the wildflowers on the Kernen Prairie. May 25 @ 7:30-8:30 pm – Join Elder Wilfred Buck, Manitoba First Nations, and gain a new appreciation for the energy ablaze in the night sky. May 25 @ 9-11 pm – Gaze at the night sky through one of 7 telescopes provided by members of the Royal Astronomical Society. May 25 @ 9-10:30 pm – Listen for the calls of the night birds at the Northeast Swale. May 25 @ 5:30-6:30 pm – Jeff Boone, City of Saskatoon entomologist, will help you identify the insects, birds, and mammals that may be living in your backyard. May 28 @ 10 am – 2 pm – Meet Charlotte and Wiggles, two Saskatchewan snakes. They’re feeling misunderstood and need a little love. May 27 @ 10-11:30 am and @ 1-3 pm – Alerces Spanish Preschool & Kindergarten invites you to look at the bushes with children’s eyes. May 26 @ 7-9 pm – Families with children are invited to plant their own flower – and maybe find out about bugs! May 27 @ 6:30-8 pm – Turn compost into squash by building a squash grow pile at the Saskatoon Food Bank’s Garden Patch. May 28 @ 1-4 pm – Take a herbal medicine plant walk at Wanuskewin. May 25 @ 7 pm - Join Renny Grilz at Winston’s Pub for A Weed Warrior’s Rant: What May Be Your Pretty Backyard Plant May Be Someone Else’s Nightmare. May 26 @ 10 am – 12 pm – Explore Saskatoon nature from the seat of a bicycle. May 27 @ 5:30 pm – Raise a pint of beer at the Woods Alehouse with Green Drinks Saskatoon. May 28 @ 2-7 pm, May 29 @ 10:30 am – 4:30 pm – Make your own fun at a loose parts pop-up playground organized by the Preston Early Learning Centre. All NatureCity Festival events are listed on their website. 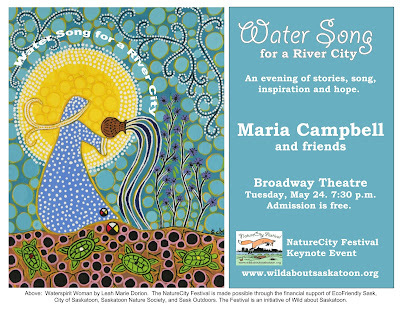 EcoFriendly Sask was pleased to support Wild About Saskatoon's 2016 NatureCity Festival with a $5,000 EcoFriendly Action Grant.